Exit polls show that age factored into voters' decision more than race. (CNN) - Race played less of a role in the presidential election than age, exit polls showed Tuesday. While Barack Obama will be the nation's first black president, John McCain would have been the oldest person ever elected to the nation's highest office. Twice as many of those polled on Tuesday said age was an important factor in their vote as those who said race was. Among those factoring age into their vote, 78 percent went for Obama compared to 21 percent for McCain, exit polls showed. Those who said race was an important factor voted 55 percent to 44 percent in favor of Obama. But Obama also was the winner by a similar margin among those who said race was not important, "which suggests that race was not a decisive factor in this election," CNN senior political analyst Bill Schneider said. The economy was the top issue in the election among 62 percent of voters questioned in exit polls on Tuesday. It was far ahead of the second-place issue, the Iraq war, which was named as the top concern of 10 percent of voters polled. Those who picked the Iraq war as their top issue voted for Obama in all but two states, according to the early exit polling results. Health care and terrorism were tied in third place at 9 percent as the issue voters were most concerned about, according to the exit polling. Those who picked terrorism as their top concern overwhelmingly chose McCain. 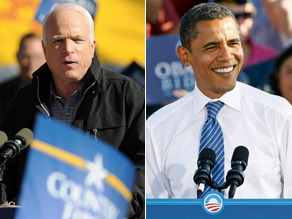 In early exit polling, first-time voters were breaking overwhelmingly for Obama over McCain by a 72 percent to 27 percent margin. First-time voters made up 10 percent of the total national electorate in the early polling results. Many of those polled said they expect a post-election tax increase, with 49 percent predicting their taxes will rise no matter who is elected president. Another 22 percent said taxes will go up only if Obama wins, and 12 percent said taxes will go up only if McCain wins. Only 15 percent said their taxes will stay the same or go down. A bare majority of those surveyed - 51 percent - think the government should do more to solve problems. Forty-three percent believe the government is doing too much. At the same time, early exit polling shows only a minority of voters - 40 percent - support the $700 billion government plan to assist failing financial companies. Fifty-six percent are opposed. GOP vice presidential nominee Sarah Palin didn't do well in exit polls. Sixty percent of those polled said the Alaska governor is not qualified to be president, if necessary; 38 percent said she is. That compares with the two-thirds of those polled who said Democratic vice presidential nominee Joe Biden is qualified to be president and the 31 percent who said he isn't. Many voters told the pollsters that they made up their minds early in the campaign season, with 61 percent saying they made up their minds before September, another 13 percent saying they decided in September and 17 percent saying they made their selection last month. Seven percent of those polled decided whom to support within the last three days. Exit polling also showed that Democrats who supported Sen. Hillary Clinton during the primaries overwhelmingly voted for Obama in the general election, 84 percent to 15 percent for McCain. For the poll, more than 16,000 people who had just voted were selected at random to fill out questionnaires. - CNN's Joe Von Kanel and Hal Quinley contributed to this report. Some hate-filled people on this blog, especially those worried about taxes, needs to go speak with Peter in Virginia. He seems to be a $mart fellow. When asked by the National Journal in 2003, "Do you think that military service inherently makes somebody better equipped to be commander-in-chief?" this politician answered, "Absolutely not. History shows that some of our greatest leaders have had little or no military experience. ... I have advised that I'd be very careful about how much you talk about that, because you don't want it to sound self-serving." The person who said that was John McCain, and the presidential candidate he was talking about was John Kerry. Is she gone? I'm tuning on ebay to see if the wardrobe is listed. McCain disrespected his opponent and the American people, and he paid the price for his lack of judgement last night. God's will has been done! GO BIG O!!!! Yo Comrade – good buy and good riddance! Buy a round trip ticket. We'll welcome you back into our once again prosperous country if you choose to rejoin humanity. Yes, McCain is too old and his judgement in picking Palin may be a direct result of the aging factor. McCain was never able to give a qualified reason why he picked Palin and neither did Palin, in fact Palin didn't know what a VP's does. The GOP had given McCain a thumbs down on Palin which gave him an opportunity to pick someone else, McCain ignored them which is more proof why McCain wasn't qualified to be president. As we celebrate this historical event let us be mindful that the greatest task is before us. When the music stops playing and the lights are turned off, we will be called upon to unite, work and sacrifice for greater good of our country. I believe that we will do so without hesitation and in a united front because Obama represents the type of leadership that will afford the vision of this country to unfold. God bless Barak Obama. He will lead, but we will all have a role in the shaping of our wonderful country. »AMERICA! AMERICA Rocks! »DEFINING/MEMORABLE moments!=Wow! Ooh! What do you mean that RACE was not a Factor...what do you call it when 90% of Blacks voted for Obama...not in just one state but virtually every state...if that is not racism, I don't know what is. Too much attention on the color of President-elect Obama's skin. He has been elected to represent all Americans. Let's get over race, why continue the nonsense of racial divide? There are more important issues facing this country we don't need more distractions. For me it was not about age or race, rather it was all about the CROOKED GOP !! Oh, do I need to remind everybody? 4. 2003 – George W. Bush – 100% UNJUSTIFIED WAR IN IRAQ which had NOTHING to do with the 9/11 attacks and STOLEN ELECTION from Al Gore due to his brother's interference in So. FL along with his mistress Katherine Harris. Need I say more? The GOP is DIRTY !! REPUBLICANS ARE CROOKS !! And you MUST BE BLIND if you don't see it...But as they say, History always seems to repeat itself... Thank You G-D for President & VP-Elect Barack Obama / Joseph Biden !! What a historic day it was yesterday. I never post on these political post, however, I felt compelled to thank the American people, especially the white americans. In my whole life, I have never been more proud of the white people than I am today. I know that there is talk about the mexicans, blacks etc putting Obama over the top, however, if the white's don't believe and split the white vote, then Obama is not the president. In order to make america the greatest nation, we have to set the standard and yesterday's vote set the standard in historic fashion, it is easy to talk about it, but it is hard to be about it. Yesterday, white americans was about change and giving a charismatic and what appears to be a sincere candidate an opportunity to go to work for the american people. I truly believe that the age factor became an issue when McCain picked Palin. If he had picked a truly qualified VP age would not have played such a big factor. the thought of Palin having to step in as President was a scary thought. I too applaud the American people on choice for President. Race, Age aside I feel Barack Obama was the right person for the job. My gut kept telling me the US wasn't ready to elect a black president . I've never been happier in my life to have been proven wrong. What a wonderful outcome of the election. It not only will strengthen this country beyond its borders, but also shows that the people of this wonderful nation have spoken and spoken well. I am a naturalized citizen and I am absolutely thrilIed to know that my vote made a difference.